Destiny 2 clan The Legend Himself took world-first honors for clearing out the new Leviathan Raid, and if you thought the players would be excited, you should see the developers. Bungie confirmed the accomplishment on its official Twitter account and shared this clip of the clan finishing off the Raid's final boss. Spoiler warning on the video if you'd rather go into the raid sight unseen. 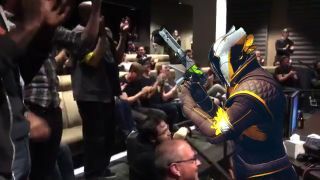 As players raced to finish the Raid, Bungie watched with eager anticipation. According to Bungie community manager David "DeeJ" Dague, the studio practically shuts down for this kind of event. These videos from inside the studio show that Bungie was just as eager to see which clan would finish first, after six hours of overcoming all-new battles, puzzles, and other challenges. Bungie puts a ton of work into these Raids, so it must be a uniquely rewarding experience to watch players figure them out for the first time. Beyond that, The Leviathan is Destiny 2's first Raid ever, the pinnacle of its PvE experience. Now players will spend weeks and months figuring out all the intricacies of The Leviathan, earning better gear to take on its inevitable hard mode. Eventually, the next raid will come and it will start all over again. Launch day was cool, but this moment was kind of the true beginning of Destiny 2. Or maybe more like the first day of the rest of Destiny 2's life. Either way, it's definitely worth some excited whoops and applause from the folks who made it happen.